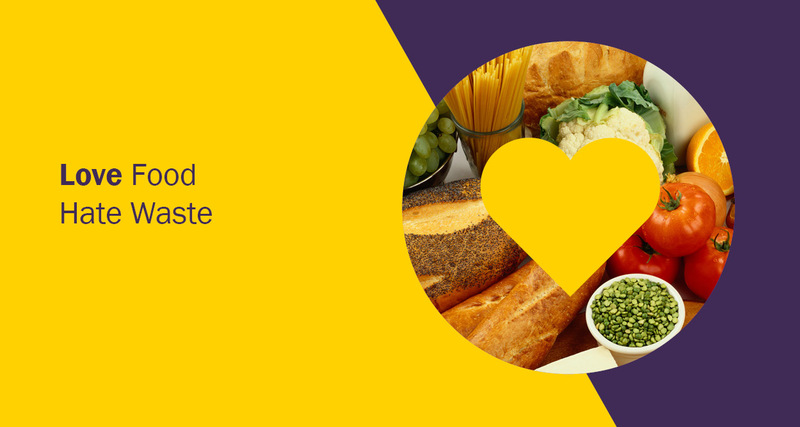 Who are Love Food Hate Waste? 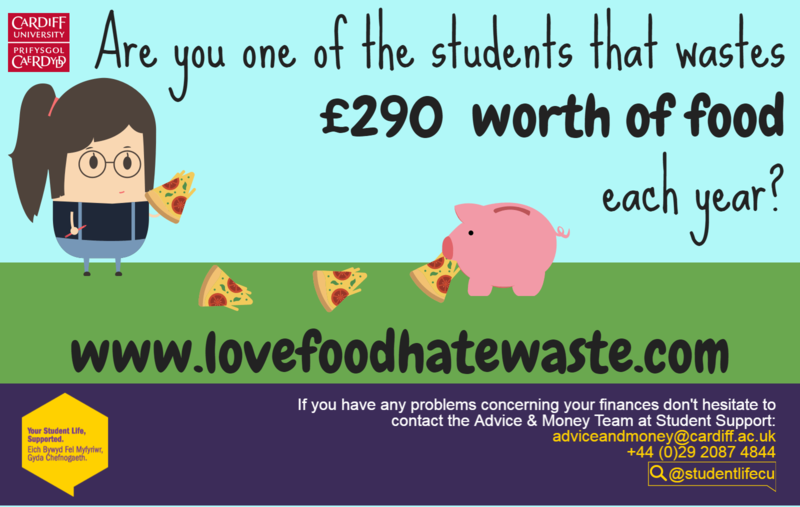 Love Food Hate Waste is a campaign run by the charity called WRAP, who are working alongside the Advice and Money Team at the Student Support Centre and the Student Advice Team at the Students Union for this year’s National Student Money Week (NSMW17). Their main aim is to reduce food waste at all ends of the scale; all the way from production, to consumption, to disposal. Seeing as this year’s theme for NSMW is Waste Not Want Not they’ve provided excellent support in terms of knowledge and skills around this subject. What’s the problem with food? 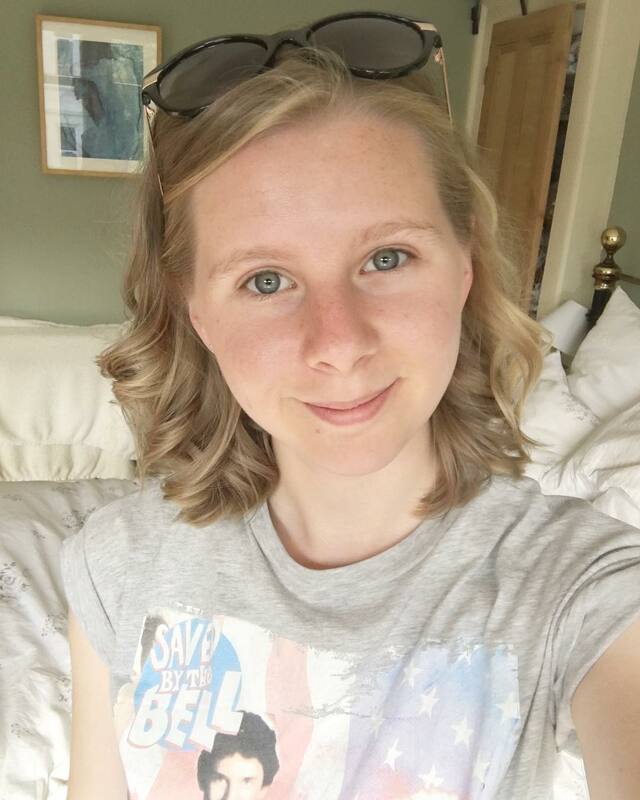 Last week I attended a training session run by Love Food Hate Waste and learned a whole lot about food waste in the UK. For me, the most surprising part of the whole experience was having facts and statistics really put into perspective. For example, did you know that, collectively, UK homes waste 7.3 million tonnes of food per year? That’s enough to fill the Principality Stadium 10 times over! Of this food waste 4.4 million tonnes is avoidable and 1.3 million tonnes of that is purely due to overcooking (ie. not knowing your quantities). How many times have you accidentally cooked enough pasta for a small army? Same here! Food waste is listed as the 3rd biggest impact on climate change. This is because as food deteriorates it releases methane which is a greenhouse gas and thus affects climate change. To be honest, I had no idea about this. I thought being on top of my recycling for the council was doing my bit but having been given the information from Love Food Hate Waste I now realise managing my food waste is just as important, if not more so. Managing your food waste by being in control of your portions is also good for your health and for your pocket! As a student we all know how important our bank balance is. On average it is understood that food waste costs a single person £290 per year; this is just from overcooking and overbuying! Let’s start with quantities. It’s really helpful to learn how much you actually need to eat in terms of nutrition. During the training session we did a group exercise where we had to match up an item of food with the correct quantity and sometimes the results were surprising. For example, when cooking spaghetti for one, you only need enough to fill a hole the size of a one penny coin! That seems like nothing when you look at it, but once it’s expanded in the water, it’s just right. could you take it in turns cooking for your housemates? If you’re going away for the weekend make sure you clear out any food that may go off, perhaps give it to other housemates or put leftovers in the freezer. If you do bulk buy (veg is often cheaper this way) can you bulk cook and freeze some portions? Not only should this help minimise your food waste it is likely to help save money in your pocket too! So what about the freezer? Ah yes, the freezer. That magical box that fixes everything. Got some chicken with a use by date for tomorrow but you’re not sure what your plans are for the week? Stick it in the freezer! You’ve bought a loaf of bread but more often than not you don’t get through it before it starts turning green. Stick it in the freezer before then! And if I’ve defrosted my raw chicken, cooked it and there’s some leftover, can I freeze that? Of course! Just make sure it’s piping hot when you heat it the second time round! And what if I’ve got leftovers but I want them tomorrow? You can put them in the fridge rather than the freezer, but you should probably eat them within two days. Except rice – did you know rice is one of the most common causes of food poisoning?! If you have leftover rice then you need to cool it as quickly as possible and make sure it is a fridge or freezer within 2 hours of cooking it. If you put it in the fridge then you need to eat the rice within 24 hours; if you put it in the freezer you need to eat it with 24 hours of defrosting. In either case, make sure it is piping hot before you serve it. Please see here for more tips on managing rice and other leftovers. When to know if something is safe to eat? Best before: This is a guideline by which it is suggested that you should eat the food by. Most foods are absolutely fine to eat after this date, it’s just there to let you know when the food will be at its best quality. Use by: This date is usually law. Meat products, eggs and milk should not be consumed after this date. Display until: If you see this on your food, then don’t even worry about it. It has nothing to do with how safe the food is to eat, or when to eat it by. This date is purely for the retailers and won’t affect you at all. Sell by: Like with ‘display until’ there’s no need to worry about this date either. It’s purely for retail purposes! ‘Sell by 13/02/17’? You keep those raspberries for as long as they look good! Look at that! We actually learned something! The training I’ve received has been very helpful in terms of thinking about how to reduce my own food waste. As someone who lives alone I’ve learned to shop as frequently as possible in smaller quantities so not to overcook or waste anything. Now that I know how much pasta, rice and potatoes to make for a single serving, I won’t be forced to reinvent pasta carbonara five days in a row after making too much on the Monday night. All this I learned from my training with Love Food Hate Waste! I spent a whole afternoon, listening, learning and taking part in activities and discussions so you don’t have to! (No need to thank me). If you enjoyed this blog and know someone else that could learn something from it, why not share it with them? It’s always good to learn how not to end up eating the same meal four nights in a row. There are also lots of top tips and recipes available from www.lovefoodhatewaste.com to help us all. Remember that National Student Money week is taking place in the Student’s Union and on the Heath Campus all week! Want to know more about NSMW? No problem, here’s something I wrote earlier or if you want to learn more about the events that are being held around campus please follow us on Facebook and/or Twitter.